Here is an idea I absolutely love from this current SU Catalog (Sping/Summer 2009). What am I talking about....well take a peek at page #65. 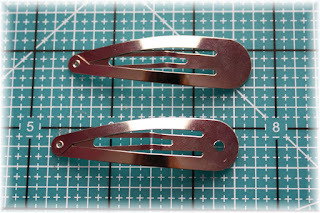 Our little Miriam loves *Hair-Clips* and when I saw the little Snap Barrettes at the Craft Store I thought of the project I have seen in the Catalog and I knew they would turn out great!!! 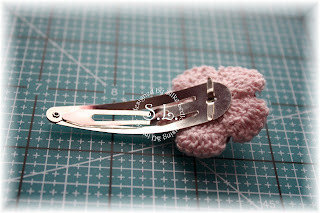 - Snap Barrettes from your Craft Store. 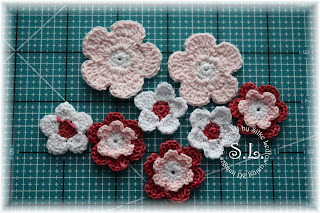 For my little project I used both the SU Fleurettes plus my sweet friend Sabrina Jackson was so nice to sent me some of her fabulous handmade crochet flowers!!! Thank you Sabrina - I love them!!! I soooo wish I could show you how it looks on our little Miriam......but it was already late when I created this project and my sweet little Miriam was sleeping...that means I have to comeback and show you all how great they look!!! I'll be gone in the morning so look out for a photo in the later afternoon!!! Holy Moly these are cool!! I can't believe how easily they attach with the brads!! I love these!! These are super cute!!! What a great idea to attach with brads! Oh how cute! Can't wait to see the photo. I think I'll try to make some for my neice! Thanks for sharing. Oh my gosh, these are so adorable! I love them, I bet your daughter was tickled pink to have these, especially with the bling, way too cute! This is super sweet! I bet Miriam looks like a princess with them in her hair!! Thank you!!!! My daughter would love those and I have been trying to figure them out for a while. You made life so much easier. What a super cute project! I'll definitely be watching for a photo! Oh Silke - these are marvelous! I've got to make these for my little girl and I've got to make them RIGHT NOW. I can't wait to see your little Miriam model these for us. Thank you for the great idea! Ack!!! So cute, Silke!! I'm squealing over here! Oh my word....what an easy way to attach those flowers!!! Great projects. FANNNNNNNNNNN-TABULOUS!! You blow my mind! These are so fun Silke. They would be great for Easter. 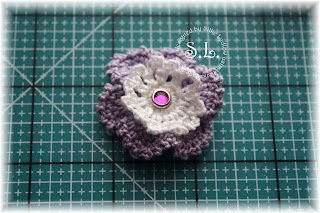 I have been trying to make these flowers but they are harder than they look. Super job..
Hey girly, I was hoping you'd like those flowers. Glad you got them so quick. It only took 2 days to get to you, that is just fab. I have plenty more, so I'll send some more your way. My hubby actually thinks I am little nuts for making so many ;P. Men just don't know! How sweet is that?!?! Thanks for the tutorial! This *almost* makes me want to have another baby to try for a girl! :) LOL!! Your DD is SO gorgeous! What a sweetie!! Silke, these are adorable!! You are so creative! 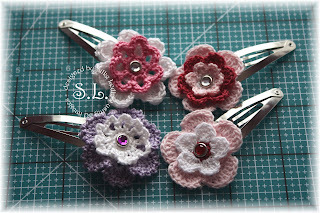 I am hoping my mum can teach me how to crochet when she comes to visit in a few weeks! Super cute! Oh how adorable, Silke! And an easy project even I can get done within a matter of minutes. 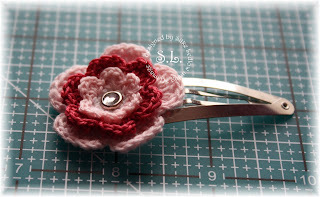 I've adorned these crocheted fleurettes and now will have to get a batch or make some. I would love to make these for my daughter! And would make great gifts too! What a clever little project! 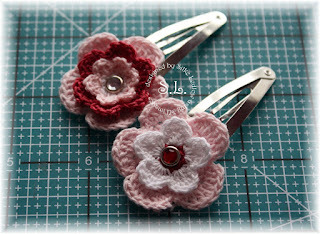 Silke - these are adorable and Miriam looks so precious wearing hers! 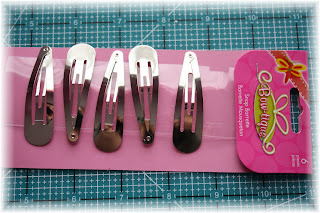 Those clips are adoreable. And Miriam sure looks special with the clip in her hair, and so cute. I love your blog, you cards are awesome. 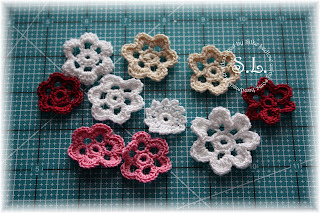 I have tried to make the flowers, but can't seem to find a good pattern to make them. 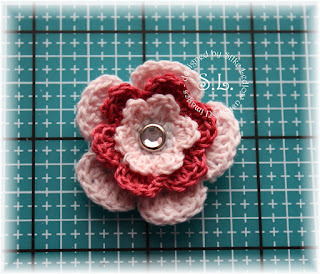 Maybe your friend can share her pattern for the flowers. Would love to try them with a different pattern.